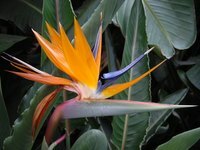 The bird of paradise, known scientifically as the Strelitzia reginae, is a flowering member of the banana family. Instead of having a trunk, however, it has many stalks that grow out of a unified root system. You can propagate birds of paradise by dividing an adult plant or cultivating them from seeds. Propagate an adult bird of paradise plant in the early spring, before it gets its new growth. Remove the bird of paradise from the pot. Locate the natural divisions where the plant seems to be splitting. In a large plant, there may be two or three distinct clusters where the bird of paradise is already trying to split apart. Separate the roots from each other as much as you can, leaving each section with its own clump of roots. Cut the plants apart with a clean, sharp knife. Be careful not to disturb the roots more than you have to, but the plant itself is fairly hardy. Dust the cut areas with a rooting hormone to encourage new growth. Re-pot each section in its own large container, using a normal commercial potting soil. Do You Plant Birds of Paradise in Sun or Shade? Avoid watering the plants for 2 or 3 days to let the new cuts heal a little, and then water moderately until the plants are established. Fill a bowl with room temperature water and soak the seeds in the bowl overnight. Nick the seeds with a very sharp knife to facilitate sprouting. The hard case of the bird of paradise seed can make germination difficult if there is no opening. Plant the seeds in a pot filled with vermiculite. They should be planted about ½ inch in the vermiculite. Place a glass jar upside down over the seeds to keep them humid. Keep the soil moist, but not soggy. The seeds should germinate within 8 to 12 weeks. Transplant the bird of paradise seedlings when they have produced two leaves.